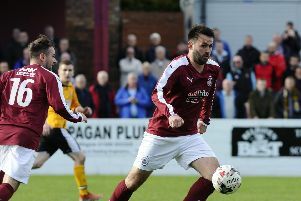 Linlithgow Rose hit the goal trail in spectacular style on Saturday as they rammed 11 goals past Ormiston, reports Susan Hill. 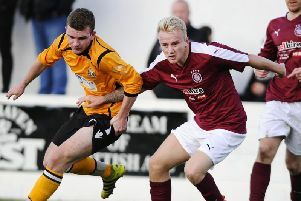 Rose boss Mark Bradley had been far from happy with his side’s showing against Fort William the previous week. And his criticisms certainly go the desired response from his players. Right from the off the Rose were on the attack and a great ball from Gary Thom was brilliantly controlled by Owen Ronald, but rather than shooting he elected to pass to Kevin Watt who was flagged offside. However it took only eight minutes for the Rose to take the lead when Tommy Coyne sent a powerful header past Euan Robertson from a perfect Robert Sloan corner. Two minutes later Kieran Watson fouled Ronald in the box but Coyne’s weak spot kick was easily saved by Robertson. Sloan got the ball stuck under his feet when a goal looked certain, Blair Batchelor’s shot was turned round the post and Coyne hit the bar from close range. Ronald then shot over and Watt headed narrowly wide as the one way traffic continued but the Rose still only had one goal to show for their dominance. However the second finally arrived on 25 minutes, Ronald sending a lovely left foot shot into the top corner after good work by Batchelor. Three minutes later Coyne was pulled down by Robertson and this time Watt easily beat the keeper from the spot kick. And 10 minutes from half-time Sloan hit the bar from a free-kick and Coyne headed home the rebound to put Rose four up. Just before half-time Iain Gray was fortunate to avoid a red card after raising his hands in a clash with Anes Subasic. It took Rose only seven minutes of the second half to score again, Thom heading home Kyle Turnbull’s cross, and Colin Strickland made it 6-0 on 65 minutes, turning home a low Watt cross. Number seven came two minutes later, quick passing from Watt and Batchelor allowing Strickland to fire low past Robertson. Only a further minute elapsed before Ormiston got a consolation goal when slack defending allowed Keith Buckley time and space to shoot home from eight yards in what was their only shot on target in the match. Stung by conceding, the Rose went straight to the other end and were awarded a third penalty when Robertson needlessly brought down Watt, the Rose man repeating his earlier spot kick effort. Rose were still hungry for goals and Ruari Maclennan went on a great run before finding brother Roddy who cut the ball back for Watt to strike first time into the far corner and complete his hat-trick. More good slick passing between Gray, Batchelor and Martyn Shields then freed Strickland to complete his hat-trick, and make it double figures, with another low shot into the bottom corner. There was just no let up from the Rose and Robertson did well to turn over Shields’s fierce long range effort. However with two minutes to go Strickland completed the rout with another low shot after a fine run and pass from Ruari Maclennan.